The release of Handbrake 1.0.0 makes the phrase - Handbrake H.265 encoder a hot search, because Handbrake updated its encoders with support for H.265 and VP9 by leveraging x265. Many users are curious about the video quality and size about the output H.265 video, but most of them encounter various problems during H.265 encoding with Handbrake, such as Handbrake can't convert H.264 to H.265, the converted H.265 video won't play, etc. In the post, we will help you get a head start about HEVC/H.265 encoder Handbrake, how to encode video to HEVC with best handbrake settings and the solutions to solve H.265/HEVC encoding problems. the internal GUI helps you easily understand how to use it to convert H.264, MPEG4, MP4, AVI, etc. to H.265/HEVC video for smooth playback on VLC, QuickTime player, Windows Media Player without x265 codec pack needed. Plus, this tested amazing HEVC converter can encode video to H265 4K/1080p/720p (24-60 fps) with only 8%-18% CPU usage. Note: To ensure a sound H.265/x265 encoding on Handbrake, free download Handbrake 1.0.0 or later version on your PC as it added full support for 4K codecs H265 and VP9. Then follow the Handbrake guide to create high-quality and small H.265/HEVC for 4K UHD or Full HD videos. Step 1: Install and run Handbrake. Load input video file by clicking the File button on the top left side. Or you can tap the Folder to batch import multiple files at a time. It will take a few minutes to scan the title. Step 2: Click the Browse button to set the destination folder you want. Step 3: Since Handbrake adds the profile for H.265 MKV on the version 1.0.0 and above, please go to the presets on the right side -> scroll down to find the Matroska profile -> choose H.265 MKV 1080p30, 720p30, 576p25 or 480p30 at your desire. 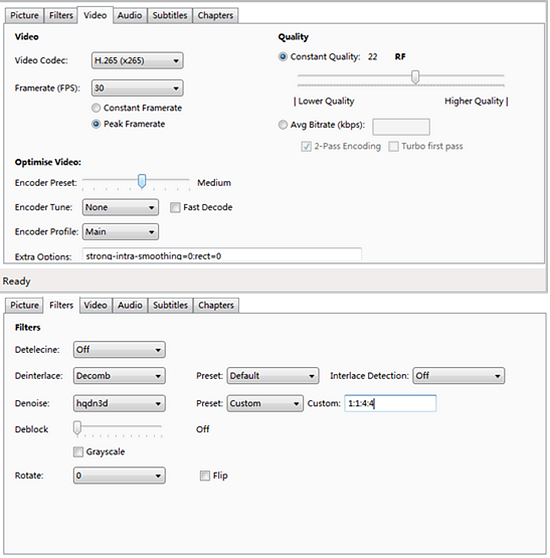 Or you can choose video container format as MP4 and manually choose codec as "H265" in the video encoder option. Step 4: Tweak settings. Generally, please leave the settings unchanged if you're a newbie. You can freely customize your video if you're a salted user. 4.1) Change the Constant Quality value to 23 for HD 1080p videos and 22 for HD 720p videos. Generally, the smaller the RF value is, the better quality and higher bitrates are, and vice versa. Please don't go any lower than 30 or higher than 15 in order to get good quality with acceptable size. 4.2) Frame rate stands for the video smoothness. Higher the frame rate is, smoother the video will be. In general, we human being watch video smoothly enough at 24fps. You can properly improve your frame rate to 30fps or 60fps according to the video resolution. There is no meaning if you turn up the frame rate too high. 4.3) Leave the audio codec unchanged in the Audio tab -> properly improve audio bitrate to 128 or 256kbps (no real difference between 256kbps and 320kbps to our hearing). 4.4) Change Mixdown from Mono or Stereo to 5.1 Channels for better audio effects. 4.5) Convert audio codec to AAC, AC3, MP3, Vorbis, FLAC, etc. or add external tracks to your video. Step 5: Click Start button to begin to free encode and convert video to H265 with Handbrake after finishing all the settings. Then you will get the high-quality H.265 video in small size. BTW, you can also apply Handbrake to convert H265 video to H264 with the same steps. 1. "I downloaded the latest version of H.265 encoder Handbrake (1.0.0) which includes both H.264 & H.265 video encoding and try to run an MKV file for comparing the difference. It is true that the size of H.265 encoded video is the half of H.264 video. But, the transcoded H.265 video can't play on any video players including VLC and QuickTime. Is there something wrong? Can someone help me?" Method: 1. update your media player (VLC) and install x265 codec packs (K-Lite codec pack, libde265, etc.) or download better H.265 player (X265, DivX, 5KPlayer, etc). 2. check your computer or device hardware configurations to see if they support hardware HEVC decoding. If not, upgrade your computer or device to latest model. 3. upgrade to macOS High Sierra, Windows 10 or iOS 11, for operating system is also a big part in the whole HEVC video playback process. 2. 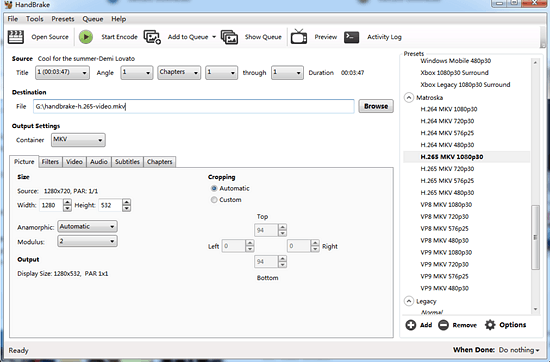 "It takes me much time to convert H.265 video with Handbrake 1.0.0. Is there any practical H.265 video encoder or HEVC converter recommendation? BTW, I also don't want to come up against any Handbrake H.265 playback issue. Thanks in advance." Method: Download Handbrake alternative (HEVC video converter) to encode H.265 video file at Intel QSV, multiple CPU cores and hyper-threading tech accelerated speed, up to 5X faster than Handbrake HEVC encoding speed. What's more, it also converts video to HEVC 4K, HEVC 2K/1080p/720p with best quality. Admittedly, Handbrake, as a free open source HEVC encoder, has already performed quite well. Yet, on account of its free attribute, it can't be constantly upgraded to satisfy user's growing needs like higher and higher demands on video settings. And that's why the shareware HEVC video converter comes into being. With professional developer team and principle of users first, the shareware alternative to Handbrake like MacX Video Converter Pro is keeping upgrades on its HEVC encoding algorithm to provide you with 5X faster speed to convert and encode any video to HEVC x265. That's just the tip of the iceberg. This Mac HEVC video converter also has the edge over handbrake in video settings, letting you compress and resize 4K 2160p to 1080p/720p, change frame rate from 24fps to 60fps, adjust video bit rate, tweak audio settings (codec, mixdown, sample rate, bit rate), add external subtitles to HEVC, merge videos into one, rotate HEVC 90/180/270 degrees, trim HEVC to shorten video length, add watermarks and remove HEVC unwanted black borders, etc. Step 1: Free download this HEVC/H.265 decoder & encoder on your Mac; if you are a Windows user, you should head to Windows version of H.265 encoder/converter. Launch this stellar HEVC video converter and click "+ Video" button to load the video file you want to convert. 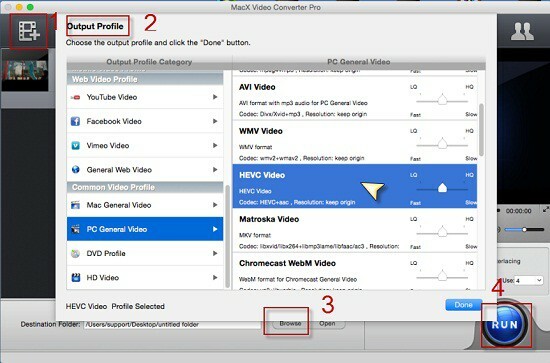 Step 2: Go to the output profile to choose "HEVC Video" under category "PC General Video" as the output video format. Step 3: Set a destination folder to store the converted H.265/HEVC video file. Step 4: Hit "RUN" button to start the H.265 video converting. Warm tips: This all-around best Handbrake H265 decoder alternative also is able to get H.265 4K/8K video download from YouTube, Vimeo, Vevo and other 300+ video sharing sites for offline enjoyment. Handbrake too slow to convert hevc to h264? Utilize handbrake CPU and GPU acceleration to speed up x265 to x264 video conversion process at 2X faster speed than before. YouTube video, esp. YouTube 4K video consumes large amount of space on your mobile device. How to solve this issue? Free convert YouTube video to HEVC from H264 to save up to 50% space for your device. MKV brings higher quality at the cost of larger file size. To make upload MKV to YouTube faster, you're suggested to convert MKV to HEVC codec with more efficient video compression algorithm to shrink your video file size for faster uploading to YouTube or Vimeo without losing quality. MacX Video Converter Pro is a smashing H.265 converter to convert any H.264, MPEG4 VP9/VP8 videos to H.265/HEVC codec video with no quality loss and fast speed. It also enables you to download H.265 videos free from YouTube, Vimeo and over 300 sites.